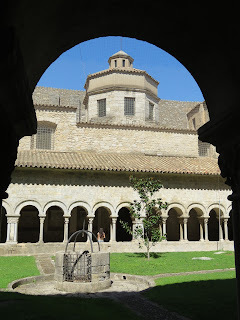 In the heart of the ancient Cathedral of Santa Maria sits a beautiful cloister. It's a quiet place, hidden away from the bustle of the outside world, making it a perfect spot for peaceful contemplation - just so long as a bus-load of tourists isn't in the vicinity. Luckily, the morning I stopped by, I pretty much had it to myself. Sitting in a quiet corner, admiring the way the shadows played across the ancient tombstones that line the floor it would have been easy to convince myself that I'd slipped through time into another age. In a place like this, if you sit very, very still and let you mind roam free it's easy to hear echoes from the distant past. All around are shrines and ossuaries that stand witness to lives that have been lived and have ended in a world far removed from our own. 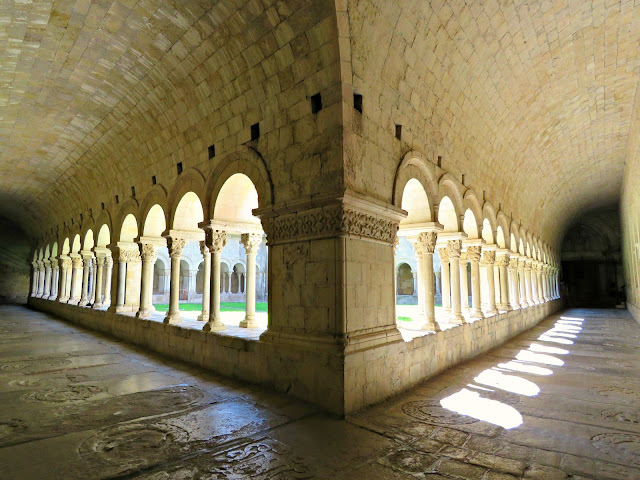 Their histories speak of wars and crusades, of lives lived within the cloister and of dynastic rivalries that have long since been superseded by the rise of the modern nation states. Even in death there's a hierarchy that this place adheres to. 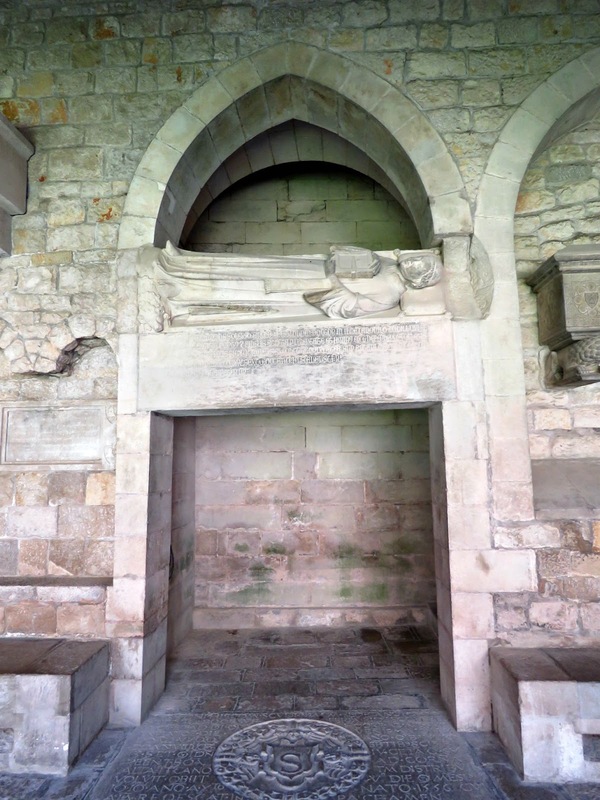 The lowly canons, who lived holy lives of no great ecclesiastical distinction, are interred under the floor.The more elevated prelates and bigwigs were given more elevated positions with elaborate ossuaries and tombs along the walls that encircle the cloister. 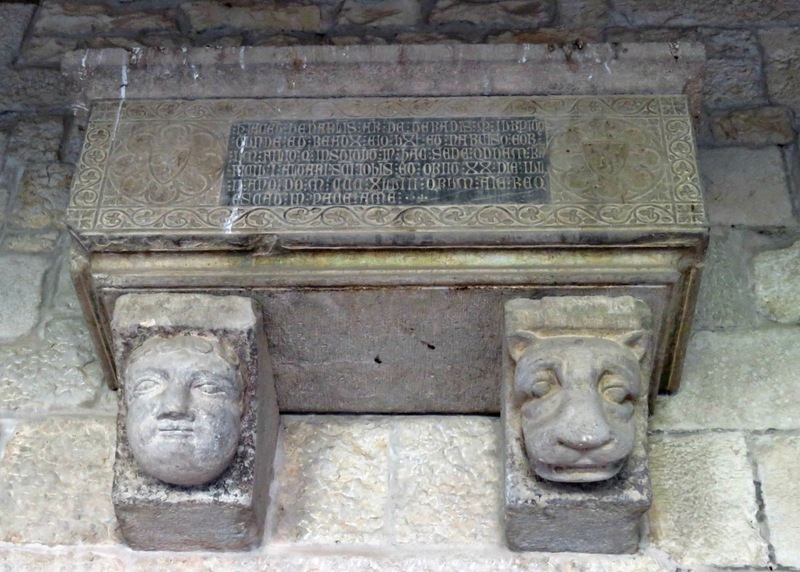 And then there's the tomb of Arnau de Soler, who was the Archdeacon of Besalú, one of the eight dignitaries of the chapter, until he died in 1326. He's the chap who paid for the amazing silver baldachin that is suspended over the High Altar in the Cathedral church. It's an exquisite thing with much elaborate decoration, which includes a scene that depicts Saint Peter opening the doors of heaven to admit Arnau de Soler. 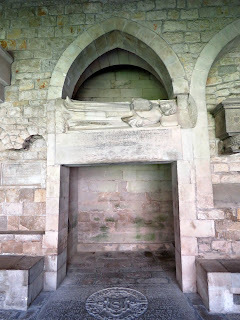 Anyway, they repaid his generosity by ... giving him a tomb over one of the the doorways coming off the cloister, and his effigy lies at a gravity-defying angle that made me worry that it might slide off onto the floor. Still it's been clinging on up there by its fingernails for almost 700 years, so it's probably safe to walk underneath ... . The cloister was built in the 12th century, and would then have been the domain of the chapter of canons who lived within the precinct of the Cathedral. Its purpose was to divide the space where they lived their daily lives from the sacred space within the Cathedral Church itself where worship took place. The Cathedral Chapter predates the cloister. The canons have been around for at least a millennium, assisting the bishop in the administration of his Cathedral, and in ministering to his diocese. Throughout that time they lived in the area adjacent to the Cathedral Church. From the 10th century there is documentary evidence of a number of buildings constructed here for their use. 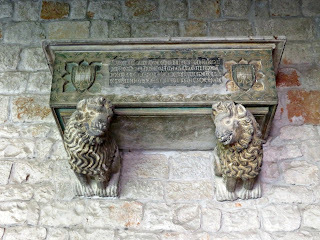 They would have trooped across this space to their dormitory and refectory, their library and their cellar for a couple of centuries before the cloister was laid out. Perhaps there was another, earlier and less elaborate courtyard that funnelled them off to the various places that they needed to go. 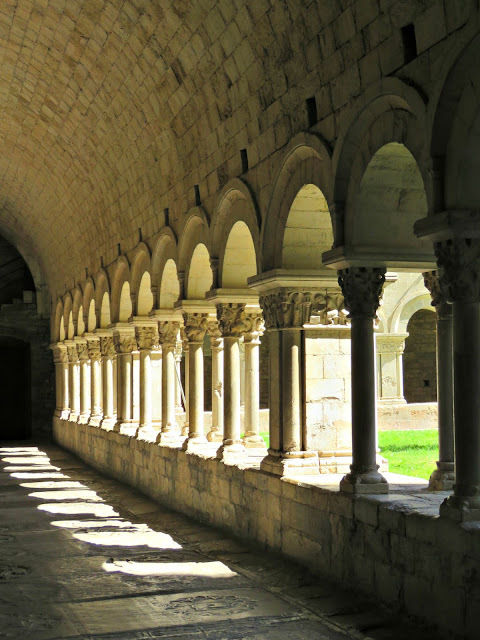 I can imagine the canons shuffling past as construction of the cloister got underway. 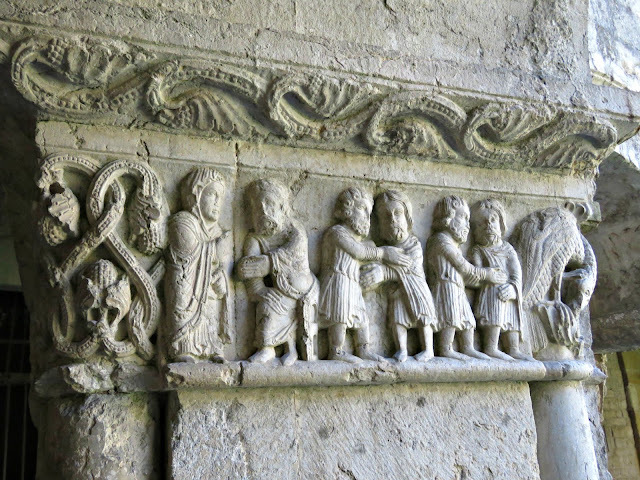 There'd have been a school of specialist stone masons hard at work carving the elaborate capitals for the columns. No doubt the clergy filing past cast a critical eye over their depiction of the biblical scenes that feature large in the decoration. Maybe someone stopped from time to time to correct a mistake or elaborate on how it might be improved. 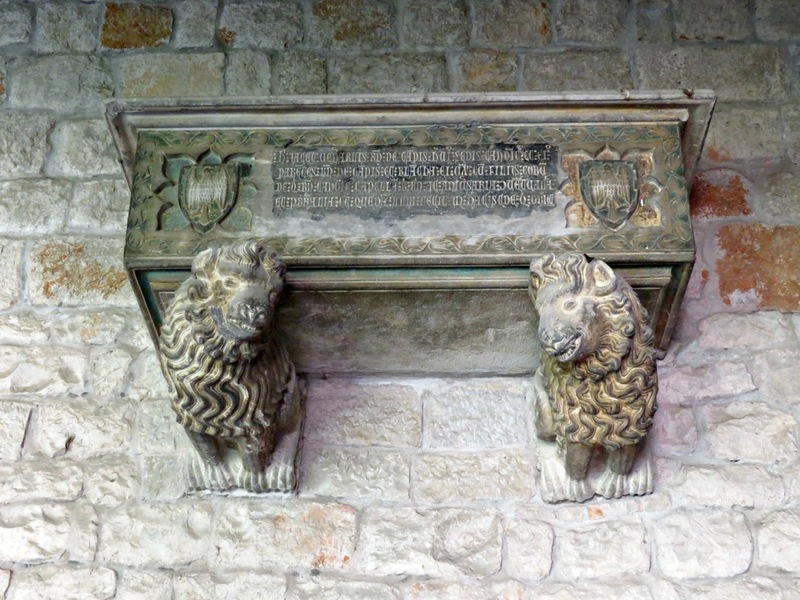 And it's said that the various animals and beasts that are featured represent musical notes so that, as the canons passed by, they were able to read the score of the Stabat Mater Dolorosa. Back in the day this would have been a busy place, busier in many ways than it is today. Hence, my notions of quiet contemplation may well be historically inaccurate. The records indicate that this was one of the most densely populated cathedrals in all of Spain. 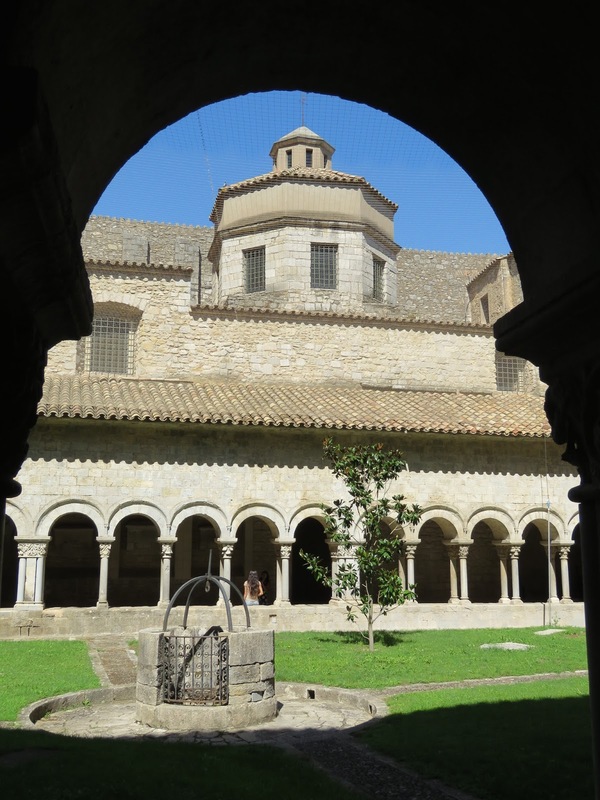 In the medieval and early modern periods the chapter had 8 dignitaries: the head archdeacon, the head sacristan, the cantor, the abbot of Sant Feliu, the arch deacons of Besalú, Empordà and La Selva and the Dean. In addition to the dignitaries there were 36 canons and 140 clergy with benefices all living and working in the Cathedral precinct. Added to which there would have been a couple of dozen choir boys. 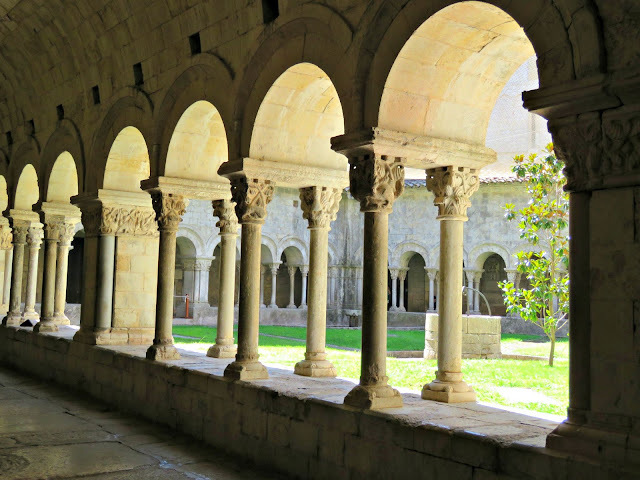 So all things told there would have been the better part of 200 people rattling around this cloister at all times of the day and night as they marked the canonical hours. Through the arches of the cloister you also get a good view of Charlemagne's Tower, one of the bell towers of the original 11th century Cathedral. Admittedly you've got to peer through the pigeon netting, which rather dulls its photographic impact. 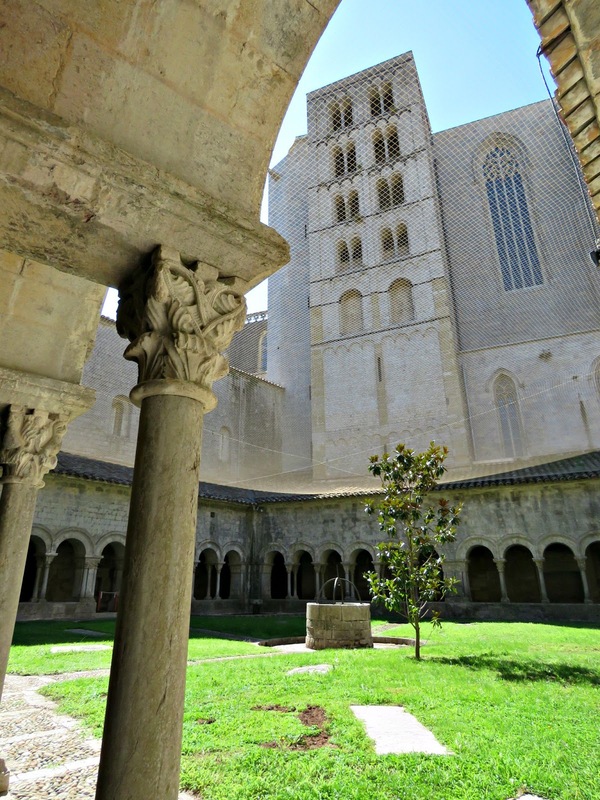 If you'd like to visit and see the cloister for yourself you can find the Cathedral's website here: Girona Cathedral. What a magnificent structure, it sure induces calm and serenity. 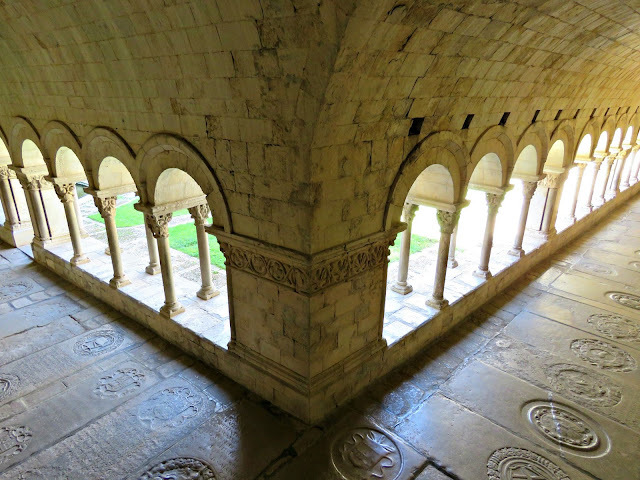 The cloister is fabulous. Great photo-tour and info, Bonny! Thanks. It is just amazing that structures like this have stood the test of time for so long. I bet it would be a peaceful place to reflect on life. Wonderful photo tour.